Idar and Ajmer­11 each; Jodhpur­10; Itanagar­9; Malda­7; Gorakhpur and Harnai­6 each. Note on NEM will be published on Monday evening at 9 pm...delayed by a day. SWM Monsoon changes mind, and re-tracks into Rajasthan and Haryana... a very rare and unusual happening...axis moves into Central India. 8 days since i started writing on BB-13, and am still going on ! BB-13, is swinging in vertical heights, and due to very favourable conditions and optimum pressure , is still having precipitation capacity, even in its "old age". From Kutch, where it is situated today (Friday Evening), that too as a low, it will track Northwards into the International border, and move in a Easterly direction for a short distance thence. Rainfall will be heavy on Saturday in the (imaginary) Bachau-Jodhpur- Ahmedabad triangle. Heavy Rains expected around Region of Palanpur, Gandhinagar and Mt.Abu. Passing rain expected all along the coast from Baroda southwards thru Bharuch and Surat upto Maharashtra coast.Cloudy and showers in places expected all over South and East Rajasthan upto Delhi NCR. Clouds and thunder activity in NCR possible. Mumbai: Cloudy, and cirro stratus anvils forming (Lightning possible). Passing showers expected. Mumbai: Cloudy and showers , with lightning possible. Rain amount around 10 mms. Thundery developments in outer townships . Surat: Cloudy with some light showers on Saturday and Sunday slight increase in intensity possible. Light showers in parts of NCR. Thunderstorm again possible in Kolkata on Saturday with around 20 mms rains. Favourable chances of a thunder shower in Chennai on Saturday. This will be discussed in vagaries' meet on Saturday, and then published. In the meanwhile, your thought can be put in the comments on the blog/fb. 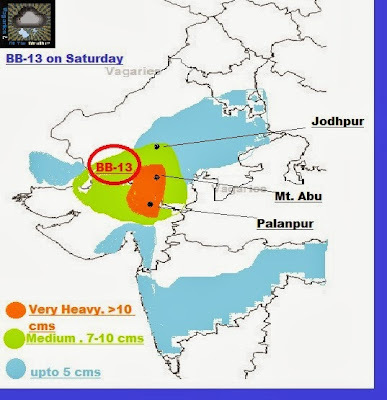 The UAC (BB-13) moves N/NE, with centre around the South Rajasthan region. But, rainfall segment will be in the South and SW of system. Heavy rans are likely in Kutch, Northern Gujarat region and Southern Rajasthan. Heavy rains likely in Jamnagar, Deesa, Kutch (Gujarat) and Barmer (Raj) regions. Mumbai: Friday will be partly cloudy with sunny intervals. Passing showers amounting to around 10 mms. 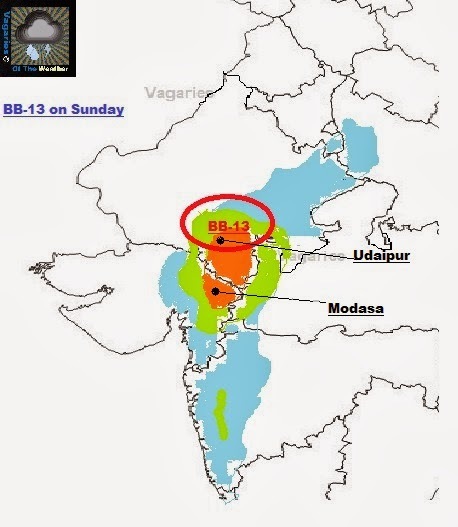 Rains can increase again in Bharuch and Surat regions from Sunday. Delhi NCR also can get rains on Sunday....more of all this tomorrow (Friday) when the weekend forecast comes up. Adjoining Pakistan regions of Badin and SE Sindh can get light/modertae showers. Karachi can get showers overnight and early morning. Hyderabad (Pakistan) can get light showers in the vicinity. 1- southwesterly winds blowing from the Arabian sea. 2-obstructed by the anti clockwise winds over Northern Gujrat and Rajasthan obstructed this system from moving anywhere 'where the monsoon withdrawal High pressure was trying to establish itself. something to do with WD's ? non stop rain in mumbai subrub started. I think low enterd somere daman or palghar coast.now heavr rain in thane for past half and hour.all pridiction are failed those whose saaid sw monsoon withdraw frm entire gujrat on 20 to 25 sep13.some time mumbai receive monsoon withdrawal shower in mid october..ur view on that.. Suddenly got dark, overcast and very windy at Andheri. No rain here though so far. Looking at the current Lightning map it definitely does not look like it's September end. The map looks like we are in the beginning of September. how is it retaining so much moisture as to its tracking back to rajasthan and haryana? ?Has this ever happened before?? @ SSET/SAM Khan : Please try to attend Vagaries meeting in Panvel at 3pm on 28th Sept.. Would be happy to meet & interact more on current tricky BB low..
Light to moderate rain in SE sindh today.last 24 hrs rain up to 8 am morning ,nagarparkar 40mm,diplo16mm. It seems Lord Krishna of Dwaraka has converted mm into cm!!! I THING NEXT WEEK LOW NEAR MUMBAI.. SO MUMBAI CAN GET HAVEY RAIN. The BB-14 which you mentioned resembles with 'MONSOON DEPRESSION" . Rain in Mumbai and konkan coast to get heavier by next weekend. Should be fun. the other models shows mjo moving away from indian ocean.? Viravanalluran / Rajeshbhai : Thanks for drawing attention back to Mascarene High and the cross equatorial flow!